Warsaw Districts – where to stay in Warsaw? 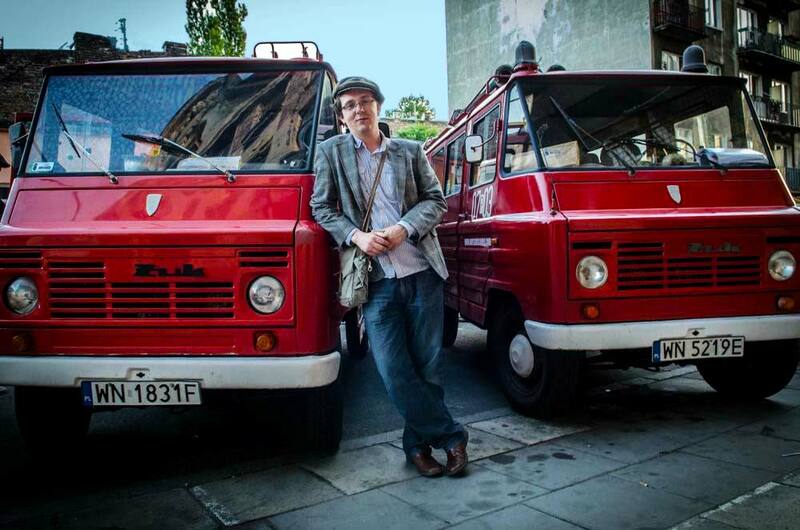 Hop on an original communist van restored to perfection! We believe that interesting stories have the power to ignite a fire within yourself, spiking a hunger for knowledge that you didn’t even know you had! 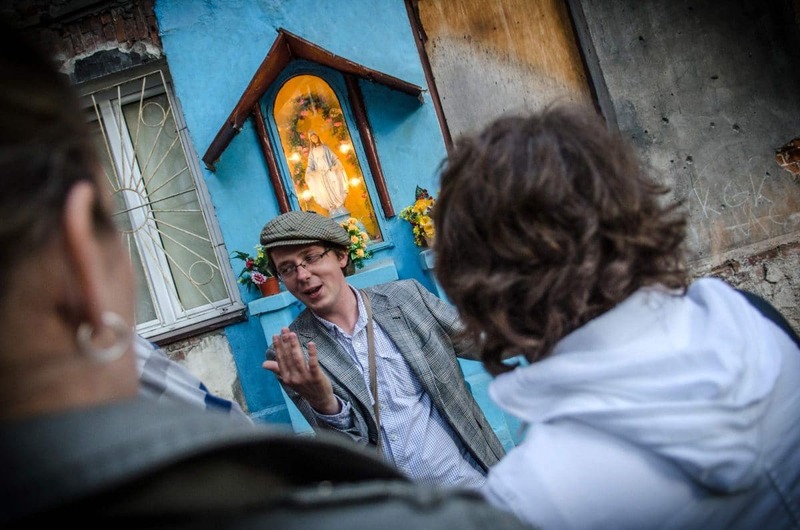 Because of this, the Warsaw Alternative tour focuses on powerful, yet historically accurate, storytelling. All of our trips are on an iconic "Zuk", original communist truck restored to perfection. While zooming across Warsaw, we’ll listen to popular songs from pre-war Warsaw and from Polish communist times! The guides' main goal is to be able to transmit their love for Warsaw to as many people as possible. The guides are lively, bright and love their job! Their English proficiency is of the highest standard for and it’s easily understandable even if you are not a native English speaker. The tour focuses on the complicated history of 20th Century – World War II, Warsaw Ghetto, Warsaw Uprising, life under communism. 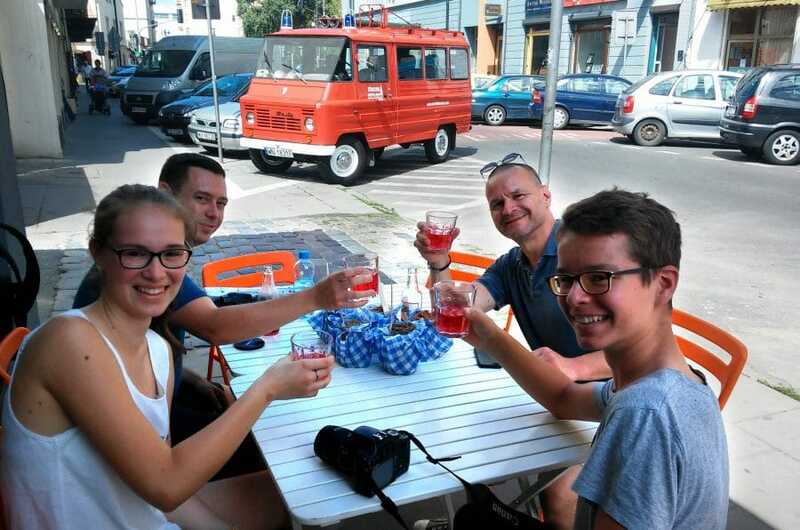 The guide will take you our favorite place to try local Polish food and traditional Polish vodka. Get to know socialist realism architecture: Palace of Culture and Science and the communist neighborhood. Discover belle époque streets and hidden pre-war courtyards. Hear the heartbreaking story of Warsaw Jewish ghetto. 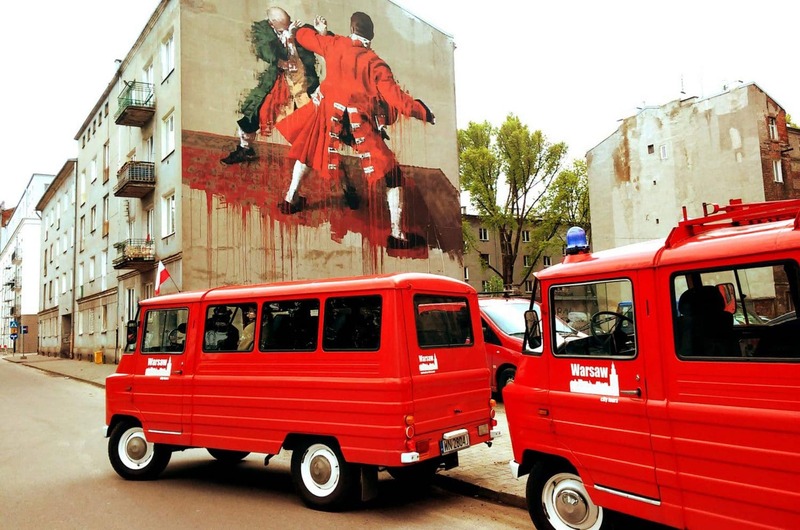 Check out the original Praga district – a hidden, hip and artistic gem of Warsaw. Visit places that tourists don’t usually have a chance to see. NOTE: Pickup for shared tours is available up to 1 kilometer radius from the city center (the central point is the Palace of Culture and Science). If your hotel/apartment is located farther our advisor will suggest the closest and most comfortable meeting point. This tour is available for adults and children taller than 150 centimeters (4,9 ft) only. Hotel pickup (Up to 1 kilometer from the Palace of Culture and Science. We strongly recommend booking in advance. Last minute availability is not guaranteed. We believe that interesting stories have the power to ignite a fire within yourself, spiking a hunger for knowledge that you didn’t even know you had! Because of this, the Warsaw Alternative tour focuses on powerful, yet historically accurate, storytelling. 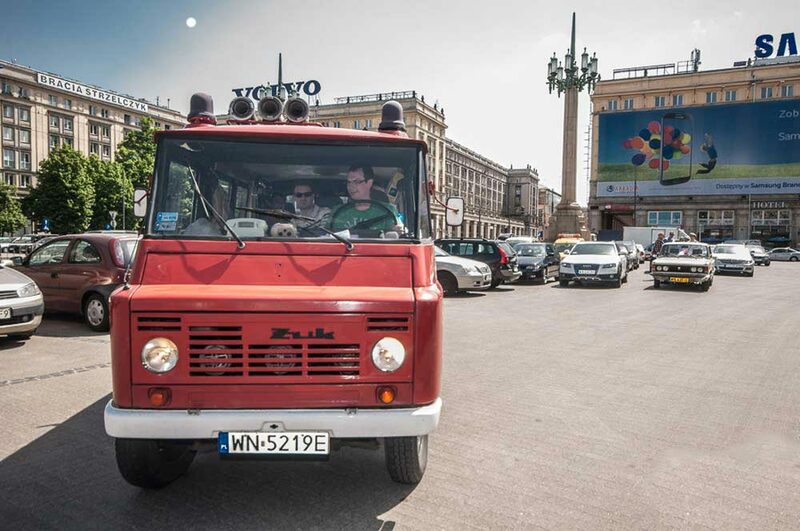 All of our trips are on an iconic "Zuk", original communist fire truck restored to perfection. While zooming across Warsaw, we’ll listen to popular songs from pre-war Warsaw and from Polish communist times! The guides' main goal is to be able to transmit their love for Warsaw to as many people as possible. The guides are lively, bright and love their job! Their English proficiency is of the highest standard for and it’s easily understandable even if you are not a native English speaker. The tour focuses on the complicated history of 20th Century – World War II, Warsaw Ghetto, Warsaw Uprising, and life under communism. 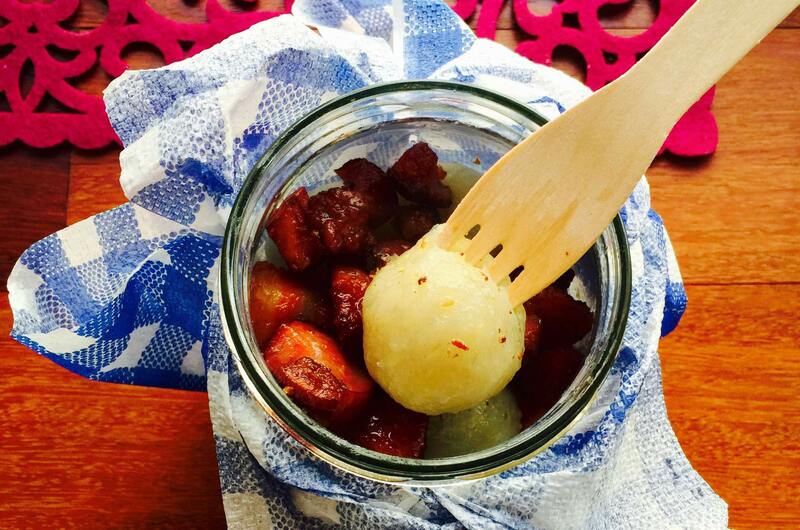 The guide will take you our favorite place to try local Polish food and traditional Polish vodka. is the Palace of Culture and Science). If your hotel/apartment is located farther our advisor will suggest the closest and most comfortable meeting point. Our driver & guide was Lucas. He was quite simply amazing. He is an extremely entertaining and knowledgable young man with seemingly boundless energy. It was huge fun from start to finish. He took us to places we would never have found, provided fascinating insights into the history of each one and kept us amused with relevant stories and jokes. The tour concluded at a tiny restaurant. Most of us had pyzy stuffed with various filling, topped with something delicious and served in a jam jar. It was served with a shot of vodka mixed with orange & chocolate. If you visit Warsaw, you have to take this tour. It was certainly the highlight of our visit. Outstanding, foodie/historian/super nice guide (Marek) that seemed to personally know everybody involved in- and everything worth knowing about the history and making of- polish food. Don’t miss this tour with this company, v e r y well worth the price!! Guides are historians who really love the city. Super quick response organizing it for a solo traveler. The guide takes his time to explain everything, instead of rushing to every spot in the city. Extremely personal experience for the group. DID I MENTION THE BUS??! We have just finished our tour with Lucas. Couldn’t have wished for a more knowledgeable, funny, enthusiastic guide. We had a fabulous tour taking in the history of Walsall, past and present. The traditional cafe was a delight. Altogether an excellent tour. I will recommend. We've just got back home from Warsaw and we really need to say thank you,Lucas,for offering us the best Polish experience.All the Polish people we had met were mean,so meeting such a nice person as Lucas was a big surprise.We weren't sure about booking this tour but it was definetely the best decision.We couldn't have discovered all these places in Warsaw if it wasn't for our lovely guide.We didn't realize how and when those 4 hours had passed because we had so much fun.Lucas is a hilarious guy,extremely smart and humble.Thank you for showing us the real Warsaw,full of history .Next time we'll be in town,we'll definetely choose that food tour.Sounds delicious.Thank you again 🙂 We will not forget this experience any time soon.I'm asking all people visiting Warsaw please book one of these tours.You will not regret,I promise you. 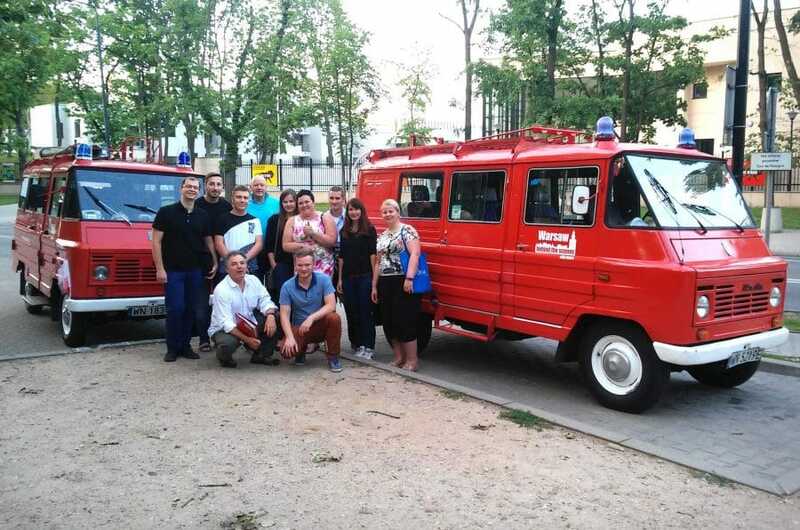 Are you ready to zip across Warsaw on a cult retro bus? Take the first step towards your Warsaw adventure! Odd Urban Things is the main web magazine for travellers (and expats) in Warsaw. Not what you are looking for? Check out the rest of the Warsaw tours. On Odd Urban Things, we provide up-to-date info about the coolest events and best stuff to do in Warsaw. On OddUrbanThings, we provide up-to-date info about the coolest events and the best stuff to do in Warsaw.